Operating voltage 100 to 250VAC or power adapter. Choice of models includes black & white or Colour system. turn on Monitor to check the exterior. to use as panic alarm function. Built in sounder in Camera unit. 1 to 4 Cameras in same System is available. Can control 4 Door Locks. Don't worry about open a wrong door lock because it always opens the door which the camera is communicating on line. 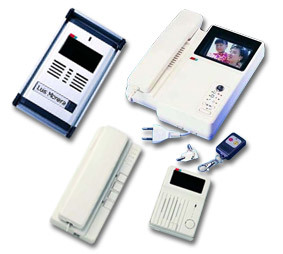 Any kind of Cameras and Monitors in the series of S-913 system are available.